Crimson Trace began business in the backroomof a machine shop in 1994. It was a typical rainy Oregon day when founder LewDanielson filled out and submitted the paperwork to launch the world’s premierlaser sight manufacturer. In the days that followed, customers sent their GLOCKpistols in for machining, wiring and installation of an embedded laser diode. Those laser sights continue to be serviced today—a strong commitmentto the many loyal customers. Great customer service has been a cornerstone ofbusiness for Crimson Trace across the decades and years, and in 2019 thoseyears in business equals 25—a quarter century. 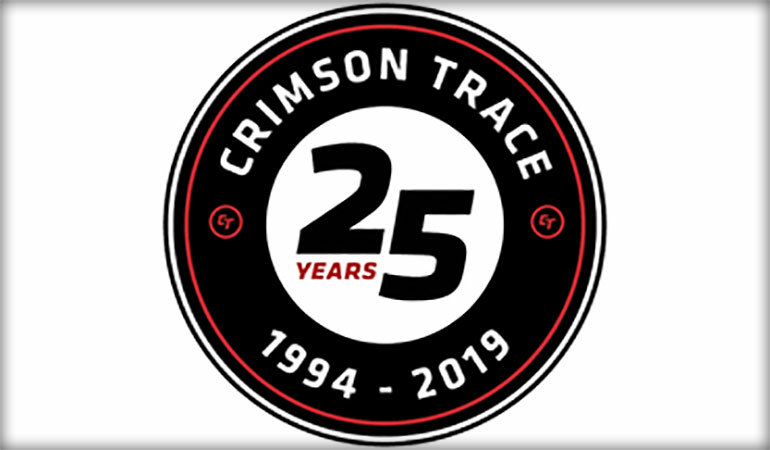 The 25 years in business for Crimson Trace haveseen many milestones, such as the release of the Lasergrips laser sights forthe popular 1911 pistols, and the LiNQ wireless remote activation technologyfor laser sights and lights for MSR rifles. Crimson Trace also began the FreeBatteries for Life program and introduced firearms owners to the patentedInstinctive Activation laser sight engagement system. Laserguard, Rail Masterand other laser sights have added to the numerous product lines the companyoffers to customers, including law enforcement and military units. The companyadded green laser diodes to numerous laser sights beginning in 2012. Recently,Crimson Trace added tactical lights, red dot sights and riflescopes to thegrowing product categories. The 25 years at Crimson Trace have resulted innumerous prestigious recognitions, including a 2017 NRA American RiflemanGolden Bullseye Award for LiNQ, being noted as America’s Top Brand by SouthwickAssociates, several Academy of Excellence awards, many shooting sports industryawards and many patents for innovation and product designs. The company alsosponsors many events in the shooting industry and launched the Midnight 3-Gunshooting competition in 2012. That all-night competition in the sandy desertrequired the use of laser sights and lights to complete the numerous shootingchallenges. In honor of 25 years of service to America’sfirearms owners, in 2019 Crimson Trace is giving away numerous special firearmsequipped with laser sights or tactical lights. These will be awarded each monthin a special 25/25/25 drawing. Details are at www.crimsontrace.com. Crimson Trace works with many firearmsmanufacturers in product designs and special product packages. Those manufacturersinclude Browning, Kimber, Remington, Smith & Wesson, and others. Manyfirearms manufacturers and retailers across America offer various firearms withCrimson Trace laser sights pre-installed. For more,visit www.crimsontrace.com or call 800-442-2406.